A new year means new opportunities for developing your professional network, recognizing your team for their hard work during the previous year, and planning for success. If you’re looking for the perfect way to make an impression on all your business contacts this year, don’t worry – our fresh fruit gifts and Edible® For Business team have you (chocolate) covered! Here are a few of our favorite WOW-worthy solutions for all your business gifting needs in 2017. Whether you’re thanking your colleagues for a job well done or establishing a professional relationship with a vendor or client, Edible® Gift Baskets are the perfect solution! Each gift basket is crafted with a delicious assortment of goodies including pineapple daisies, chocolate Dipped Fruit™, Fruit Truffles®, and more – all perfectly (and individually) packaged into an incredible presentation that’s just as fun to unwrap as it is to eat! Nothing makes a statement at the office quite like one of our legendary arrangements! We offer these delicious treats in a variety of sizes, making them perfect for any corporate gathering. 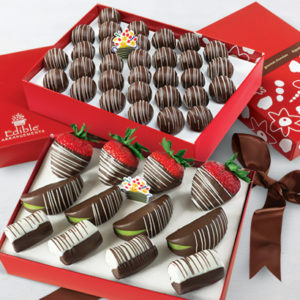 Thank the administrative professionals in your office with our Thank You Bouquet Dipped Strawberries, show your appreciation for your team’s efforts with our Hard Work Deserves Fresh Fruit gift set, kick off your next board meeting with our Fruit Festival®, or WOW the crowd at your next corporate party or event with our Field of Daisies™ – Decadence. The possibilities are endless! Personalization shows you went the extra mile when gifting, and we can’t think of a better customization option than Custom Swizzle® Colors! Available in up to 66 shades* of bold, eye-catching color, Custom Swizzle® Colors are the perfect addition to our delicious boxes of chocolate Dipped Fruit™! Whether you’re gifting to clients and vendors, celebrating in the office, or thinking of a fresh new way to reach out to prospective business contacts, Custom Swizzle® Colors in the color of their logo or yours will leave an unforgettable impression! With so many unique (and delicious!) business gifting options to choose from, you can count on us to help make 2017 your sweetest year yet! Give our Edible® For Business team a call to set up your account today! *Custom Swizzle® Colors are available in up to 66 colors at the store level only. Limited color options are currently available online.